Does The Peters Company Matter? One of my favorite things we do each quarter is to visit Austin, Texas with the Top 100 Keller Williams agents across the country and mastermind with our co-founder and owner, Gary Keller. Each quarter, we typically receive a list a books to read prior to the mastermind. 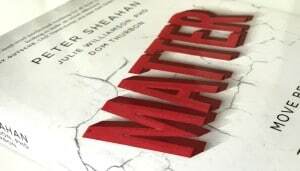 This time, Andy and I were both surprised when we were only assigned one book – Matter by Peter Sheahan. The Peters Company wants to matter. While most real estate agents are focused on getting a deal done, we are focused on the overall client experience that creates clients for life. We want our friends, family, and neighbors to know we care. And, we go above and beyond to add economic value long before there is economic opportunity for us. We place great value in getting to know our clients. That’s why, we schedule a consultation for all buyers and sellers where we find out what would make this experience an A+ for them. While most real estate agents wear the hat of a part-time buyer agent, part-time showing agent, part-time listing agent, part-time transaction coordinator, part-time marketing coordinator, part-time admin, The Peters Company specializes. We know by breaking down job duties that our clients receive the best service and care when each individual is responsible for ONE main thing! However, we know to be a business that matters, it doesn’t stop with our client experience. Our passion to help others should also transcend into our industry and community. That’s why you see Andy and I traveling to offices in the Southeast Region teaching and training agents! And, that’s why you see our team GIVING back in our communities. In the past week alone, our team hosted our past clients, friends and neighbors at The Peters Company 1st Annual Derby Party that raised $1,700 for a local Atlanta charity called CHRIS Kids. Then, we attended Keller Williams Red Day, where we volunteered with hundreds of other agents in our office as we put on a Field Day for the Fugees Family – the nation’s only school for refugee children. It is our hope that we not only bring you the very best real estate experience but also that we can give back to our industry and community. What are some ways that we can matter to you? We want to be a business that MATTERS.